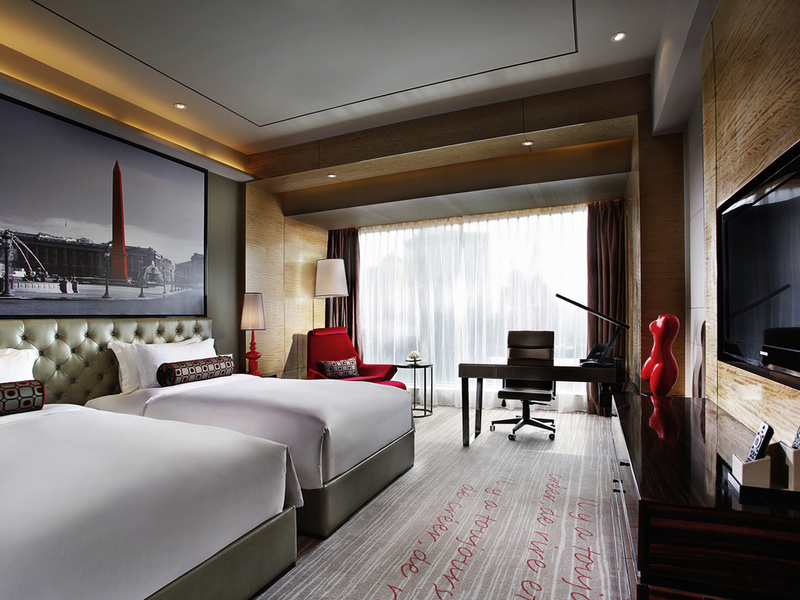 Towering over the lights of Tianhe district Sofitel Guangzhou Sunrich welcomes you to experience the art de vivre. 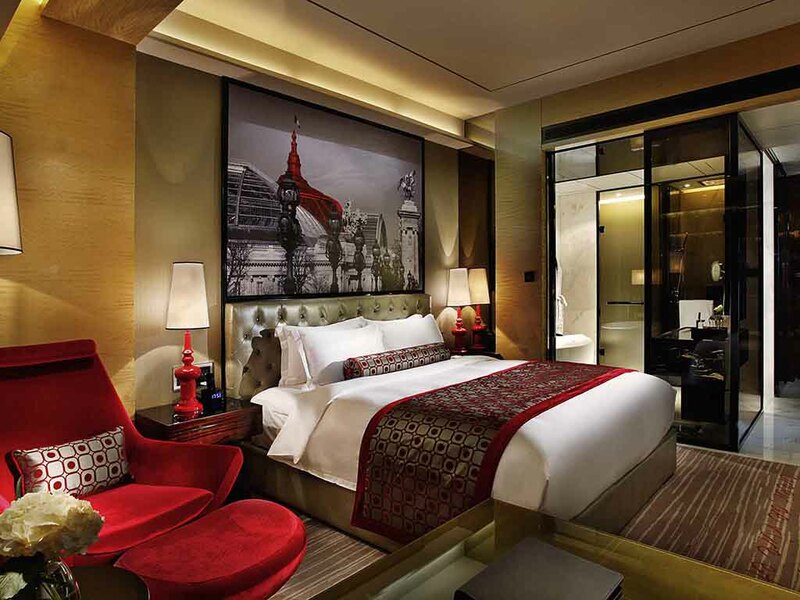 French refinement meets Chinese artistry in an elegant pairing of Sofitel luxury and local influences. 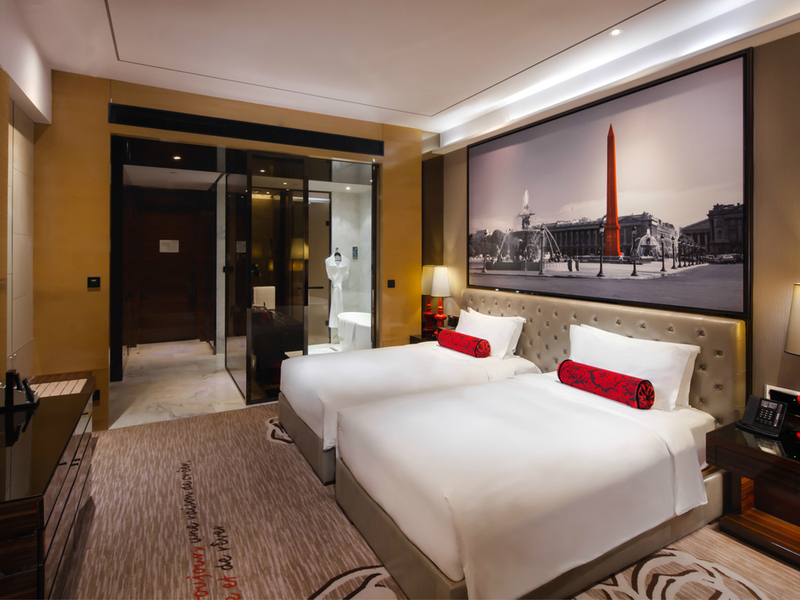 Step into any of the 493 lavish rooms and suites of our 5-star luxury hotel to find yourself in a private setting that blends modern Parisian design with the vibrance of Chinese heritage. Modern red sculptures and decor sit above carpets woven with French poetry. Bathrooms indulge you with the Hermès and L'Occitane products. Breathtaking views of the city stretch before you. Le Grill proposes the innovative cuisine and unique wine selection in an elegant environment. Modern French cosmetology joins the Middle Eastern Hammam and traditional Chinese treatments. Each Sofitel is a unique blend of the French art de vivre and local refinement. 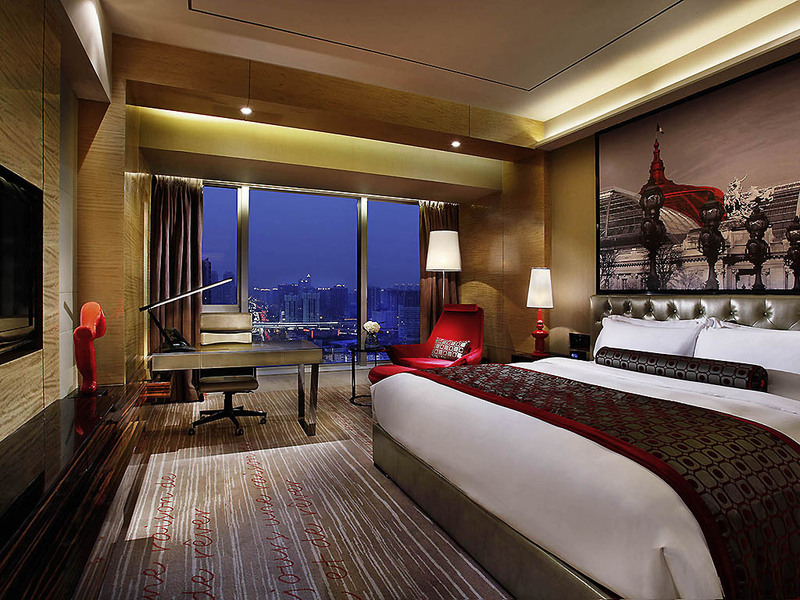 Sofitel Guangzhou Surnich brings an elegant combination of Asian contemporary décor and Parisian Chic. The design of the chandelier in the lobby combines French national flower fleur-de-lis and Guangzhou city flower Kapok that perfectly displays Sino-French influences and accentuates the strong cultural links between France and Guangzhou. A fantastic painting <Fish Song> drawn by famous local artist Chen Ben is showed in lobby as well. From the airport, drive towards the city center and follow signage towards Tianhe and then enter Guangzhou Road. 45 m² stunning modern Paris style decorated rooms, overlooking Guangzhou trendy TianHe skyline, DVD and iPod dock, 40" flat screen TV, laptop safe, Sofitel MyBed, rain shower, TV embedded in bathroom mirror, free broadband Internet. 45 m², Higher floor, Stunning modern Paris style decorated rooms & overlooking Guangzhou trendy TianHe skyline, Complimentary WiFi, DVD and iPod dock, Sofitel MyBed, Rain shower, Lanvin Bath Amenities, TV embedded in bathroom mirror. 60 m² stunning modern Paris style decorated rooms, overlooking Guangzhou trendy TianHe skyline, DVD and iPod dock, 40" flat screen TV, laptop safe, Sofitel MyBed, rain shower, TV embedded in bathroom mirror, free broadband Internet. 45 m² stunning modern Paris style decorated rooms, 1 king-size Sofitel MyBed, Club Millesime access, DVD, and iPod dock, 40" flat screen TV, laptop safe, rain shower, TV embedded in bathroom mirror, free broadband Internet. 60 m² stunning modern Paris style decorated rooms, Luxury Room, 1 king-size Sofitel MyBed, Club Millesime access, DVD and iPod dock, 40" flat screen TV, laptop safe, rain shower, TV embedded in bathroom mirror, free broadband Internet. 75 m², Corner Suite with 180° view, Overlooking Guangzhou trendy Tianhe Skyline, Club Millésime access, Complimentary WiFi, DVD, BOSE Wave and iPod dock, 42" TV, Laptop Safe, Sofitel MyBed, Rain shower, TV embedded in bathroom mirror. 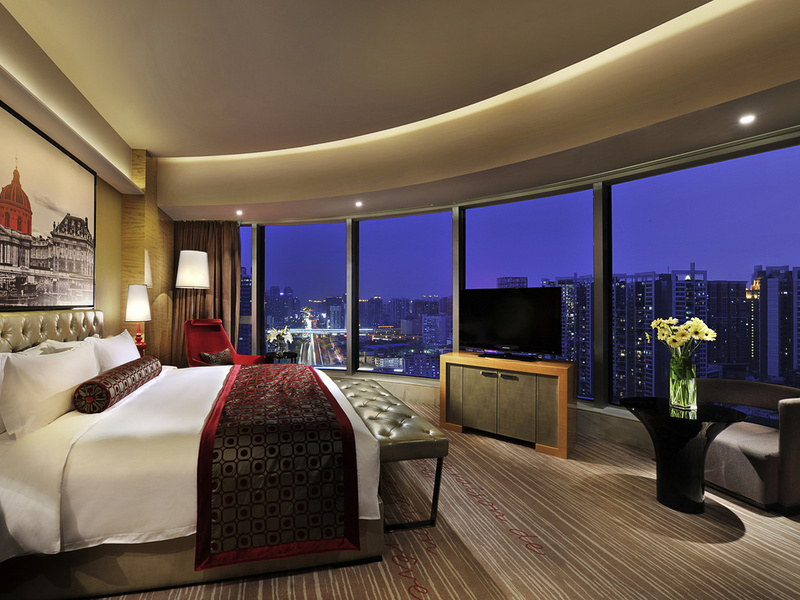 100 m², Corner Suite with 180° view, Overlooking Guangzhou trendy TianHe, Club Millésime access, BOSE Wave and Home Theater, Complimentary WiFi, iPod dock, 42" TV, Laptop Safe, Sofitel MyBed, Rain shower,TV embedded in bathroom mirror. Exclusive benefis from 24-hour private butlers to complimentary services lavish Club Millesime guests with VIP treatment. The 29th floor lounge offers private breakfasts, afternoon tea and evening drinks with canapés. Outstanding wine showcases are a signaturE of each Club Millesime in Sofitel hotels. Sofitel Guangzhou Sunrich's Sommelier meticulously curates and cares for the club's superb wine cellar, regularly sharing its vintages with guests. Restaurant name - 'LE GRILL BY NICOLAS VIENNE' changed to 'LE GRILL' New Description - The classy steakhouse proposes the innovative cuisine and Sofitel's inimitable wine selection in an elegant environment. Steeped in luxury. Savour one of the best afternoon teas in Guangzhou guided by our Tea Sommelier and complete with exquisite pastries those famed star of French cuisine. Sip sake and shochu in a setting that blends Asian and French refinement. An Afternoon Tea Inspired by the world's most iconic fashion cities. Experience French flair and Paris lifestyle in our parties from Wednesday to Saturday. A divine seafood experience as fresh as the sea; including a market of live seafoods. 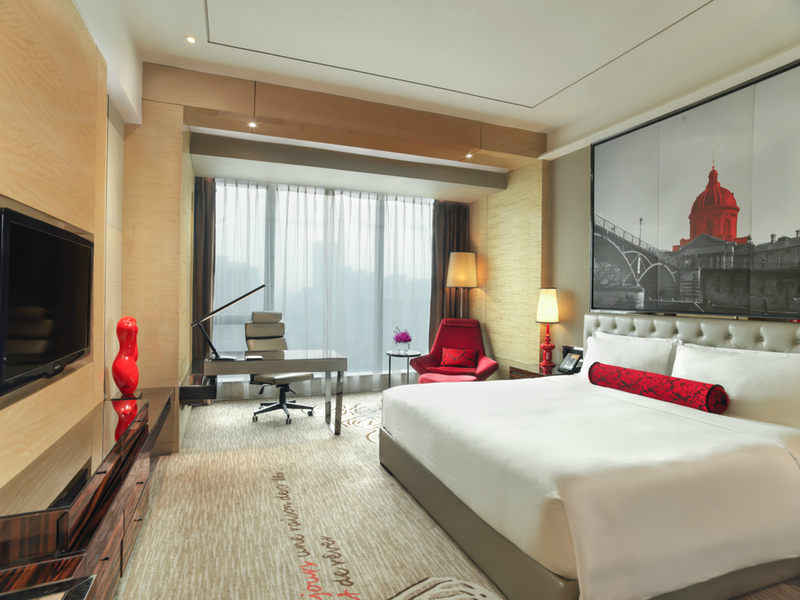 The ultimate choice for high class events in Guangzhou, the hotel features WIFI access throughout, world-class equipment in keeping with Sofitel's Magnifique Meetings initiative, plus a loft kitchen in public areas, ideal for breaks and demonstrations. Modern red sculptures and décor sit above carpets woven with French poetry. Bathrooms indulge you with Lanvin and L'Occitane products. Breathtaking views of the city stretch before you. We proudly host each event with state-of-the-art AV innovative cuisine contemporary design and sublime service. Sweep guests off their feet in the Grand Ballroom. Convene in superior style beneath the rotunda of the Salon Flaubert. With a bridal make-up room connecting with the ballroom, luxurious catering, six elegant honeymoon suites, and comprehensive wedding packages including a honeymoon in Paris, the Sofitel is the ideal setting for an unforgettable Guangzhou wedding. Celebrate within the extravagance of the Grand Ballroom. Commemorate your passion with photographed memories on the red carpet. Host a collection of special events throughout the hotel. Inspired by your love. Your wedding planner - creates and manages an event catered to your desires. The Concierge attends to every detail so that your special day will be a seamless event of exquisite beauty. Elegant honeymoon suites accommodate the bride and groom in luxurious and romantic surrounds. 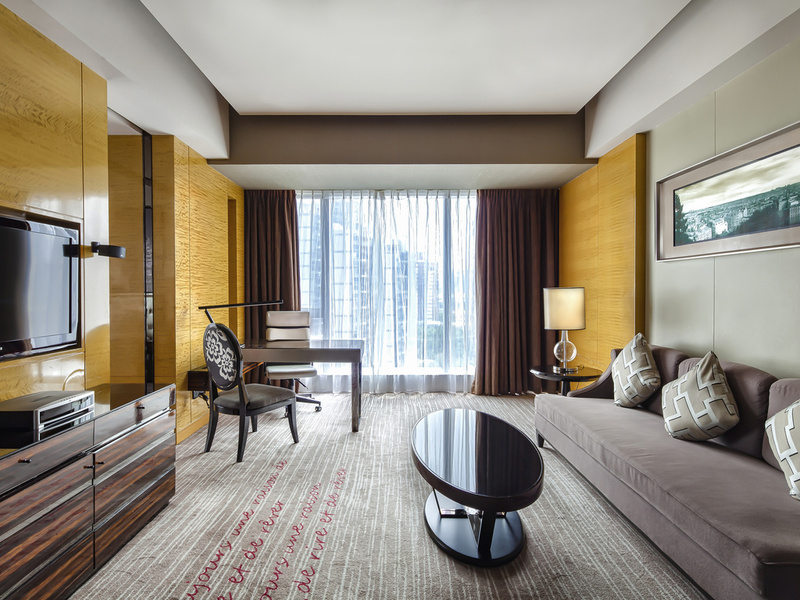 With 493 rooms and suites in modern Parisian style, Sofitel Guangzhou Sunrich welcomes all of your guests to enjoy a memorable stay. Lavish banquets to celebrate your love. Private tasting in Le Chinois. Intimate afternoon tea. Glimmering ice sculptures. The effervescence of champagne. The delicate artistry of your wedding cake. Every detail is brought to life with sweet perfection. Centrally located in Guangzhou's desirable Tianhe district near city landmark CITIC Square, Sofitel Guangzhou Sunrich is a convenient location to gather your loved ones to mark this momentous occasion in your life. L'Occitane's French expressions of beauty and fragrances of Provence flow along Asia's healing traditions. A myriad sensory experiences await in our extravagantly sensual Guangzhou spa from the hammam to ice room to floatation pool to So Sensorial Shower. Discover the fascinating history by visiting Guangdong Museum and Chen Clan Academy; feel the city vibes in Pearl River Night Cruise; taste the unique Cantonese cuisine at countless restaurants in town. Please contact me for more trendy spots in town. Benefit from experienced drivers, knowledge of the city and well maintained cars for a smooth journey. The dedicated concierge will be glad to arrange all your transportation requirements. Regular laps are a pleasure in the hotel's beautiful 30-meter infinity pool, which holds three well-kept secrets: underwater music, panoramic mountain views and temperature-controlled water all year-round.